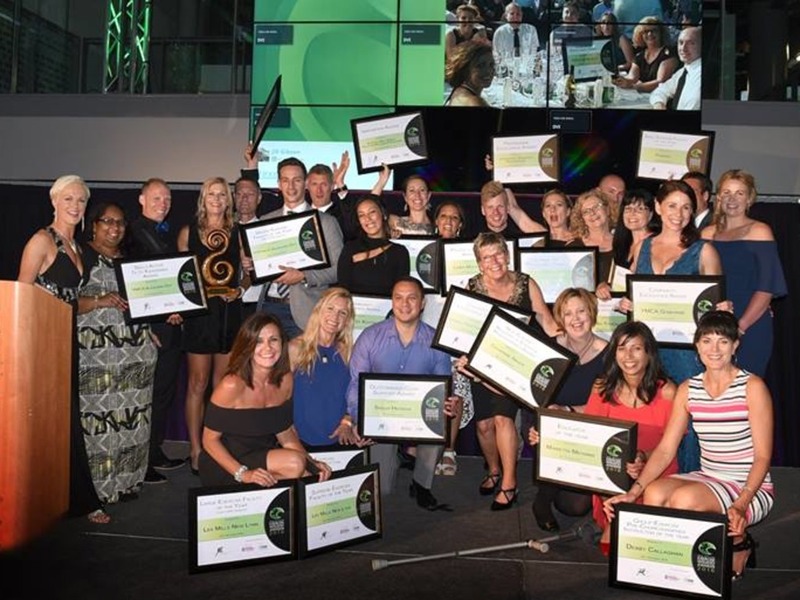 Auckland – New Zealand’s most fit and energetic professionals were awarded for their efforts in helping motivate Kiwis to stay healthy and active at the annual New Zealand Exercise Industry Awards in Auckland on November 26. The awards recognise professionals and organisations that have excelled in the fitness industry and demonstrated a notably positive impact on the lives of New Zealanders. Among the 20 awards presented were the People’s Choice, Personal Trainer of the Year, Community Excellence, Student of the Year and small, medium and large Exercise Facility of the Year. The highly coveted 2016 Personal Trainer of the Year Award went to Auckland’s Richard Ellis and Renee Riley from Collingwood was awarded Small Group Trainer of the Year. Linda Miratana from Christchurch was the only individual to receive two awards: Group Exercise Own Choreography Instructor of the Year and the People’s Choice Award. The South Island fitness industry excelled with eight winners from Dunedin, Christchurch, Nelson and Collingwood. Christchurch’s Catherine Grace received the Register of Exercise Professionals (REPs) Award for her contribution to standards and professionalism. Grace was diagnosed with rheumatoid arthritis in her 20s and told she would be in a wheelchair by the time she was 40. When she was turned away from mainstream gyms because of her health condition she saw a gap in the market to help people like herself. Kim Churton also from Christchurch received the Innovation Award for her Kia Kaha Mind and Body programme which addresses the physical, nutritional and psychological aspects of wellness for prison inmates. The programme was first trialled in Christchurch Women’s Prison and has expanded to six programmes catering for women, men and youth. In her submission for the award Churton said she has witnessed young people become better leaders, women gain confidence and men take a more balanced approach to their fitness as result of the programme. She also stated her desire to further develop the programme, expand to other sectors and take it nation-wide. The Programme Excellence award went to the Jumpstart Diabetes Programme, a 10 week programme designed to support people with diabetes to make key lifestyle changes which will ultimately enable them to better self-manage their condition and improve their general health. The Jumpstart programme has supported more than 500 people in 10 communities in Hamilton and Auckland since its inception 2 years ago. Potential winners are required to take part in a rigorous three-stage selection process before making it to the finals. Finalist judging procedures include a mystery shopper approach and live judging sessions where participants are judged on how they perform with clients under pressure. Exercise Association of New Zealand (ExerciseNZ) chief Richard Beddie says judging gets more difficult each year as the NZ health and fitness industry takes on increased responsibility and strives to come up with new ways of encouraging Kiwis to be more active. “This year’s award submissions have demonstrated how amazingly passionate and dedicated New Zealand’s exercise professionals are about the wellbeing of others. “The winners have taken innovative approaches and shown great commitment towards the industry’s common cause of inspiring people to stay healthy and active,” Beddie says. Beddie commended Dr Nigel Harris from Auckland who took out the Exercise Association of New Zealand Award for outstanding contribution to the industry. “Nigel is always supporting the exercise industry in one form or another. He was pivotal in the formation of REPs and its standards and has been a key driver behind these very awards. Nigel is highly respected in the academic world and continues to provide valuable strategic guidance to help drive the success of New Zealand’s fitness industry,” Beddie says.